Land clearing is difficult work, best left in the hands of professionals. Whether you need a lot cleared for power line utility trenching or pipeline clearing, we have the heavy equipment and years of experience to make it happen. Among our services are tree removal, stump grinding, pruning, line trimming, and more. No land clearing job is too big or too small for our team to handle. Let our arborists assess your land and identify an effective land clearing strategy for your specific needs. Contact ArborCare Tree Service for a Free Estimate. We’d love to help you with your next project. If you’re ready to get started, or if you’d like to learn more about how these services work, please contact us today. 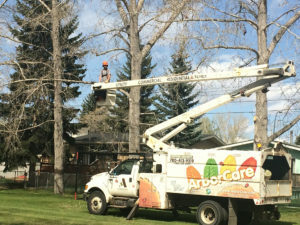 We provide free estimates for our many tree care services in Western Canada.